Even if you’re prepared and practice your safe driving skills every day, accidents do still happen. Some lucky drivers may go their entire lives without being involved in a collision, but the road can be unpredictable. Every driver should be prepared. Knowing what to do immediately after a crash can help you stay focused, reduce the chance of further injury, and protect your legal rights. Turn on your hazard lights to alert other drivers of danger. If it is a minor accident and you can safely move your car without further damage, pull over to the side of the road as soon as you can to allow regular traffic to continue. Make sure that nobody is injured. If someone is injured and in need of medical attention, call 9-1-1 immediately. Always call the police if s omeone has been hurt, or there is more than minor property damage. Ask for the other driver’s personal information. Be sure to get his or her name, address, phone number, driver’s license number, the name and expiration on the vehicle registration, and insurance information. Also record the make, model, and license plate number of his or her car. It’s wise to keep a notebook in your car with your own documentation just for this purpose. Take photographs of everything. If you have a camera (or your phone has one built in) and can do so safely, try to capture the entire scene—but don’t endanger yourself by not paying attention. Write down important details at the scene in your notebook, too. Note the time and date, location, road conditions, and any other important details that you see. Locate witnesses. Get the name, address, and phone number of any nearby witnesses, and make sure that they speak to the police before they leave. If you see a potential witness driving away, try to record a license plate number. The police can use it and try to follow up with them later. Do not leave the scene without stopping. Failure to do so can lead to stiff penalties for a hit and run violation, including jail time. Do not stand in the road. Be sure to find a safe place to exchange information with the other driver, such as a nearby sidewalk or the side of the road. Stay out of the flow of traffic. Do not admit fault. Even if you think the accident is your fault, there may be factors involved that you didn’t know about. Keep talking to a minimum and don’t say anything that could be construed as an admission of guilt—it could damage your legal case later on. Protect your rights. You can get informed by reading our free guide, 7 Biggest Mistakes That Can Ruin Your California Injury Case. Learn about the tricks that insurance companies use to undermine your rightful injury claim and prevent you from receiving the compensation you deserve. Contact an attorney. 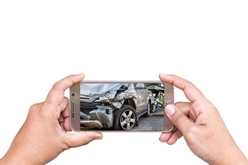 Chances are that you’ll be receiving a call from an insurance company within 24 hours, and you may want some assistance to make sure that they don’t try and shut down your claim before it even starts. A legal professional can help you make sure you’re prepared for the conversation and know your rights. If you’ve been injured in an accident, Steinberg Injury Lawyers would be honored to serve you. We only handle accident and injury cases, and we have 34 years of experience protecting the rights of our clients by helping them get fair compensation for their injuries. We’re available to help 24 hours a day, 7 days a week, so reach out today by calling 800-989-6385 for a free case evaluation.